On Friday I had to say goodbye to Joe, the volunteer pharmacist whom it’s been a true pleasure to work with all week. Joe is an Ambulatory Care Pharmacist from Boston, which means he works in a healthcare clinic and sees patients who are referred to him by the physicians in the practice. These patients are those who need extra care to manage chronic diseases like Diabetes, Hypertension, and Heart Disease and in addition to educating them about medications, he also adjusts drugs doses and medication therapy as needed to obtain the desired results for his patients based on a collaborative agreement he has with his physician supervisor. 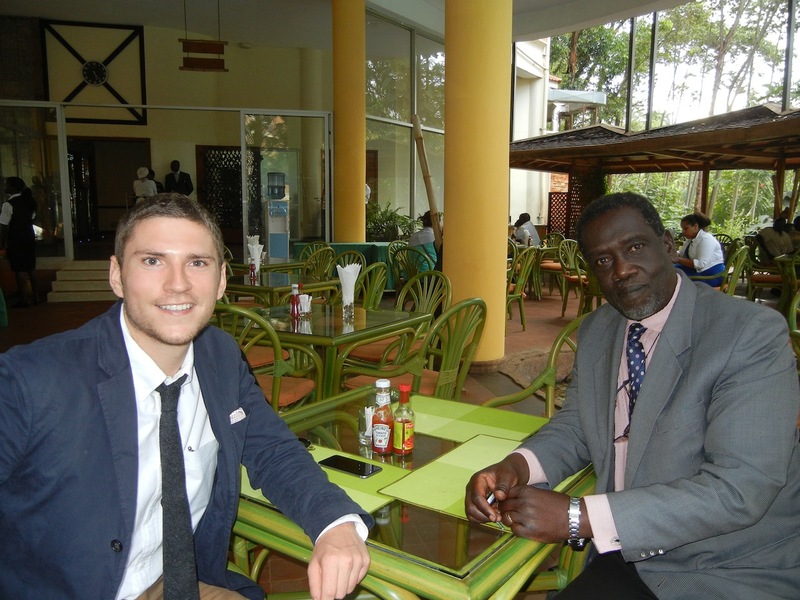 Regarding the trip to Uganda, he explained to me that he has always been interested in global health humanitarian work and to make this trip happen, he took 3 weeks of his personal holiday time to come to Uganda to teach at Makerere University Department of Pharmacy and model pharmaceutical care practice at Mulago National Referral and Teaching Hospital with the Pharmacists and Interns. Although this was his first international trip ever, he acclimated quite well, jumped right in, and continued the work of the Pharmaceutical Care Skills Lab curriculum I recently had implemented. We had spoken on the phone prior to his trip and I am so thankful for all of his help working with the Ugandan Pharmacy students as well as Ugandan Pharmacy Interns. The students clearly enjoyed their time with and learned a lot from Joe. 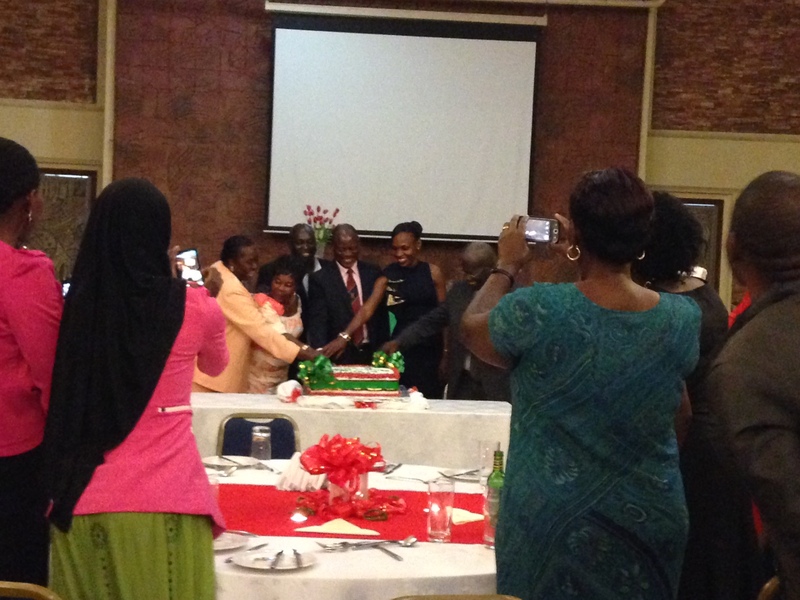 We decided to celebrate Joe’s last night in Kampala by going out to dinner but it turned out that the Makerere Nursing Program was also having a banquet that night to celebrate their 20th year of the program and the retirement of the Nursing Faculty member who started the program. So, Richard, the Professor of Pharmacy whom I work with, suggested we go out with Joe first and then all attend the Nursing celebration. Of course we were game for that plan but little did Joe and I know we were in for a real treat. The Nursing celebration was held at the Golf Club Hotel, which is quite nice, and consisted of a full evening of speeches and introductions and gift giving along with delicious food and wonderful conversations. 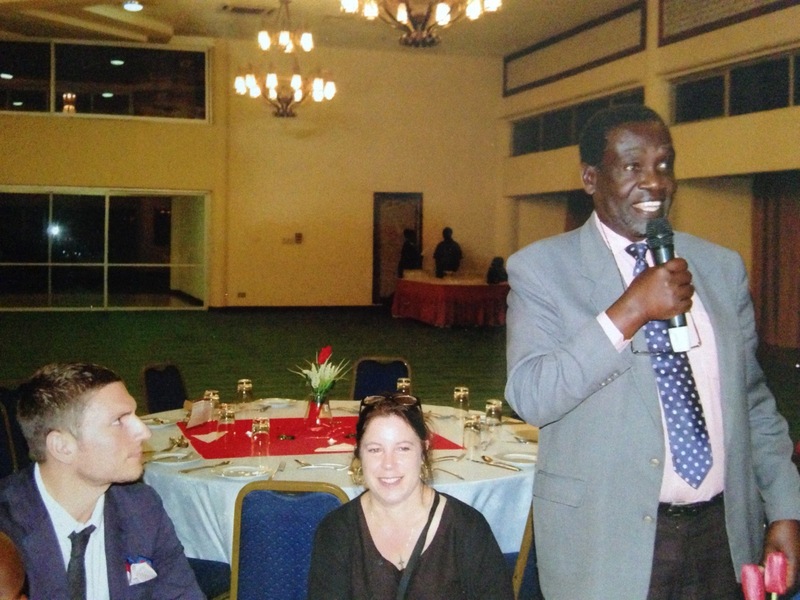 There were several special guests including the Deputy Vice Chancellor of Makerere University and the Dean Emeritus of Nursing from Johns Hopkins University who had helped to start the program at Makerere 20 years ago. Although there was much formality with the introductions and the order of speakers, and the playing of the Uganda National Anthem, the atmosphere was like a big family party. Even though Joe and I don’t have a relationship with the Department of Nursing, we were warmly welcomed as if we were family. 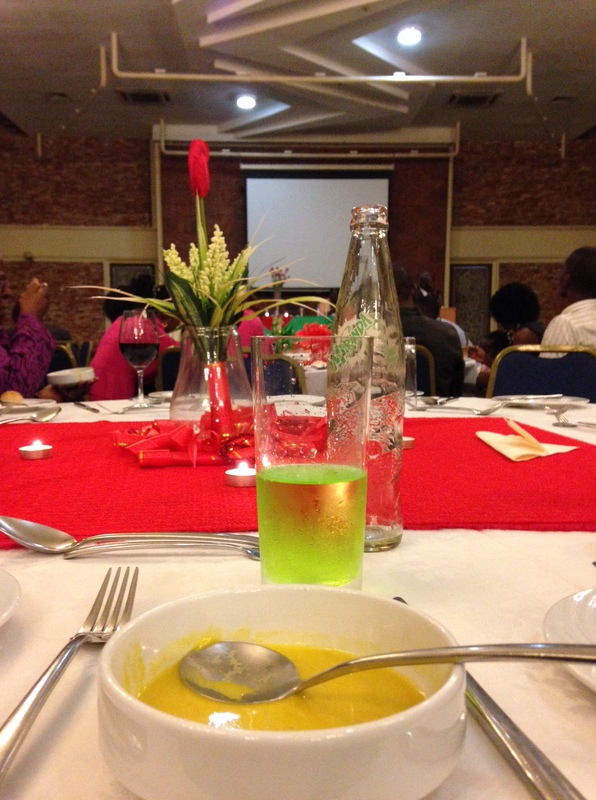 Dinner began with a bowl of delicious pumpkin soup; the green drink is a soda called Mirinda and it tastes kind of like Jolly Ranchers (an American hard candy); the decorations were lovely! Cutting the cake for the Nursing Celebration involved all of the guest who were seated on the stage and it was a huge cake! This entry was posted in Diseases/Health, Fulbright Specialist Project, Uncategorized and tagged Global Health, Global Pharmacy, Makerere University Department of Nursing, Makerere University Department of Pharmacy, Uganda, Wilkes University. Bookmark the permalink.